RH RH has announced the opening of a retail store named RH New York, The Gallery, situated in New York’s historic Meatpacking District. This gallery features RH's signature home furnishings, with 90,000 square feet, Rooftop Restaurant & Wine Terrace as well as Barista Bar. Not only this, the company will also debut New York Night, a striking six-story art installation of hand-blown crystal lights by renowned artist and designer, Alison Berger. The move underscores the company’s quest to revolutionize physical retailing and its continued foray into the hospitality segment, with an effortlessly integrated culinary offering to attract customers. RH’s consistent focus on the expansion of the chain of restaurants within its stores is expected to accelerate growth. Moreover, the company’s plans to open galleries, including integrated cafés, wine vaults and barista bars, are expected to enhance overall customer experience and drive demand. As of Aug 4, 2018, RH operated 85 retail galleries. These include 44 legacy galleries, 18 design ones, two RH Modern Gallery, and six Baby & Child ones in the United States and Canada, respectively, along with 15 Waterworks showrooms in the United States and the U.K. Driven by its stellar performance due to the focus on improving profit margins and creating new and innovative shopping experience, shares of RH have gained 83.7% in the past year, outperforming the industry’s collective growth of 9.8%. The company’s adjusted revenues (including recall accrual) increased 3.8% year over year to $640.8 million in second-quarter fiscal 2018, with comparable brand revenues increasing 5% year over year. Moreover, its direct revenues increased 5% while store revenues rose 3%. 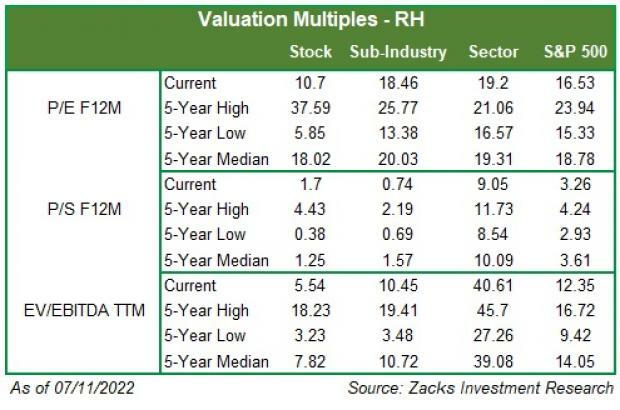 RH currently carries a Zacks Rank #2 (Buy). A few other top-ranked stocks in the Retail-Wholesale sector are Amazon.com, Inc. AMZN, Darden Restaurants, Inc. DRI and Dine Brands Global, Inc. DIN carrying a Zacks Rank #2. You can see the complete list of today’s Zacks #1 Rank (Strong Buy) stocks here. Amazon has an expected earnings growth rate of 290.6% for the current year. Darden Restaurants has reported better-than-expected earnings in the trailing four quarters, with an average of 3.1%. Dine Brands Global has reported better-than-expected earnings in the trailing four quarters, with an average of 8.1%.